Frozen Fiefdom - Post Hearing Notes and Information I Should Have Used In this section, I'll be adding items as I think of them. UPDATE March 31, 2009. Note: the paragraphs and B of A reply document also appears under the section "When Folks Don't Reply..." Section. While going through a box of mail I had recently received, I found a memo from Bank of America regarding who inquired about my Visa Account ending in 3732. B of A did not send the reply to the address I had given them, they sent it to the address on my account. Good thing I didn't need it for the March 13, 2009 hearing; Valerie was present but did not testify. Their written reply is below, and my verbal conversation with B of A staff in May of 2008 had already confirmed that no court order was on file, and no police department had had access to my account activity. That leaves Valerie Brittina Rose on the hook for coughing up a name for the officer she states in her Affidavit on Page 2 and Page 3 that was provided information on my Visa account, and later shared it with her. 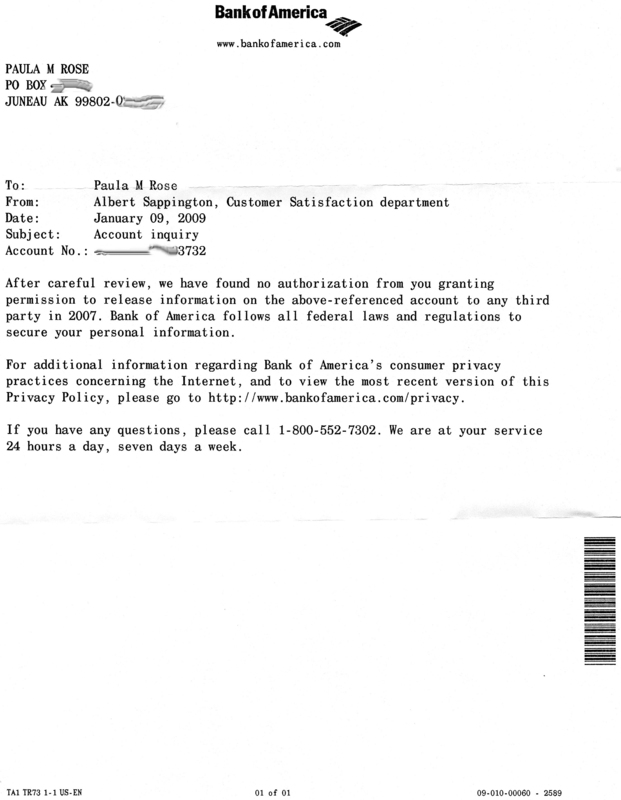 Such a statement must have been a lie from her lips, as Bank of America has always claimed that no police were given access to my account during 2007. There is nothing on the copy of the Missing Persons report that I have about any officer having an unauthorized browse of my credit card accounts, and I have no additional papers with the MP report. Valerie knew where I kept my credit card information and personal papers and would have had easy access to it. Her knowledge of some specific account activity suggests that she may have phoned up Bank of America, while impersonating me. Her affidavit is full of blather and gibberish, inaccurate or false statements, and tall tales. And I never denied renting a car in 2007, but am still very curious as to how she would known that I had. Does she have super duper eyesight to see what I am driving, or eating, or wearing, from a distance hundreds or thousands of miles between us? C'mon Valerie! Gimme the officer's name, so I can ask them about your outrageous claim; another party can take the blame. And how 'bout producing some dates, times, etc. Surely, this MP charade y'all had conjured up musta been important enough to write down on your calendars? I'll take a copy of her affidavit with me, and B of A's reply, and a copy of the MP report that Anna Sanders filed on me (but couldn't recall anything about it in her voice message to me of November 10, 2007) next stop by the local cop shop, a.k.a. The West Valley Area Police Station, conveniently located right up the street in beautiful Reseda, CA. A pleasant group of folks serving the local community, 24/7. There is no Tarzana Police Department, so who was the Troll that Valerie was talking with, and where were they located? Only in her head, it appears. March 23, 2009. I received an unsigned copy of the "Findings of Fact and Conclusions of Law" and a "Final Judgment" paper, as drafted by Mr. Grant. As expected, it contains false statements including "(1) The court finds there has been a substantial change in circumstances due to a complete breakdown of communication between Ms. Rose and most other members of her extended family, including Claire and Mr. Swanson." Claire and I speak frequently on the telephone, and Eric has been replying to several of my more recent requests through email. This statement is followed by some additional and incorrect filler statements, and the line of "A further substantial change is that there has been no in-person contact between Claire and her mother for (a blacked out word) nearly a year." While that statement is correct in the aspect of my not having in person contact with my daughter for the last eleven months; it is not stated that the reason why I did not have Summer 2008 visitation is because Eric refused to arrange it with me, and neither he nor Mr. Grant had used legal channels prior to Eric withholding visitation to address their reasons for his doing so. Apparently, this court doesn't have any objection with one parent voluntarily breaking a standing child custody agreement, and producing whatever "proof" or "evidence" necessary to justify their actions, only when called out on it by the other party. You get the idea, Readers. I assume these draft papers were to be a recap of what the judge said, but they are not the exact words and statements that I recall hearing the judge speak. Apparently, the writer is allowed to put whatever spin and slant they choose, and the judge may then choose to sign them or not. I'll be posting the final papers when I receive them, with my full side by side review of the transcripts. Then we shall all be able to read what was said, and how they said it. I apparently didn't provide the court with adequate "proof" or "evidence" that folks were not telling the whole truth in their affidavits and verbal statements; nor does it appear that their inaccuracies, false statements, or conflicting accounts of events they submitted were considered to be anything less than fully reliable. In the written statements I sent to the court and the CCI, I pointed out many discrepancies, inaccurate, misleading, conflicting, and false statements, but they were apparently not considered to be important. Admittedly, my presentation during the hearing on March 13, 2009 was extremely weak, as it's rather difficult to prepare when no Witness List by the other party was submitted by the due dates, and one doesn't know what to expect the other side to say. I mistakenly had thought that court proceedings were about finding The Truth, and I must have been the only person participating who had that thought. I don't watch TV other than financial news and the weather, so my vision of how a courtroom process works was simultaneously overrated by my desire to speak and hear truthful statements, and under-informed by the reality of the spewing of storytelling. I received a Prehearing Memorandum from Mr. Grant on March 12, 2009 which I'll post later today, with my comments. ----------------------------------------------- NOTE: As with some other documents, I have smudged out some parts of this check, and my signature. See my posting of the check below on the page created in approximately late April of 2008. http://frozenfiefdom.com/disclaimer_and_mission_statement During the March 13, 2009 hearing, Eric William Swanson gave testimony stating (I don't have the actual transcript to refer to) that he had a telephone conversation with someone named Jewel at some time, but he couldn't recall when. During his testimony, Eric stated that Jewel made some statements about me, including that I was late in paying my rent due her, and that she wanted me to move out of her home. I knew during the hearing that the information he was relaying was inaccurate and false, but didn't have this paper handy nor had I submitted it as evidence. FACT: My rent was due each month on the first (1st) day. FACT: This check is written in my handwriting and is dated August 1, 2007. FACT: The 30 day notice that I gave to Jewel is handwritten by me, and dated August 1, 2007. FACT: During the entire time frame that I rented a room from Jewel in her home, I was never late in paying my rent. FACT: Jewel never mentioned any such conversation with Eric to me, and if she did have one with him, it must have been prior to August 1, 2007. But my rent couldn't have been late, as it was not yet due. FACT: The wording and tone of my pleasant 30 day notice indicates no ill will or strain in our tenant / landlord relationship. FACT: The file date on this photo is August 1, 2007. I didn't have a copier, so I took a photo for my records. In this section, I'll be adding items as I think of them. UPDATE March 31, 2009. Note: the paragraphs and B of A reply document also appears under the section "When Folks Don't Reply..." Section. While going through a box of mail I had recently received, I found a memo from Bank of America regarding who inquired about my Visa Account ending in 3732. B of A did not send the reply to the address I had given them, they sent it to the address on my account. Good thing I didn't need it for the March 13, 2009 hearing; Valerie was present but did not testify. Their written reply is below, and my verbal conversation with B of A staff in May of 2008 had already confirmed that no court order was on file, and no police department had had access to my account activity. That leaves Valerie Brittina Rose on the hook for coughing up a name for the officer she states in her Affidavit on Page 2 and Page 3 that was provided information on my Visa account, and later shared it with her. Such a statement must have been a lie from her lips, as Bank of America has always claimed that no police were given access to my account during 2007. There is nothing on the copy of the Missing Persons report that I have about any officer having an unauthorized browse of my credit card accounts, and I have no additional papers with the MP report. Valerie knew where I kept my credit card information and personal papers and would have had easy access to it. Her knowledge of some specific account activity suggests that she may have phoned up Bank of America, while impersonating me. Her affidavit is full of blather and gibberish, inaccurate or false statements, and tall tales. And I never denied renting a car in 2007, but am still very curious as to how she would known that I had. Does she have super duper eyesight to see what I am driving, or eating, or wearing, from a distance hundreds or thousands of miles between us? C'mon Valerie! Gimme the officer's name, so I can ask them about your outrageous claim; another party can take the blame. And how 'bout producing some dates, times, etc. Surely, this MP charade y'all had conjured up musta been important enough to write down on your calendars? I'll take a copy of her affidavit with me, and B of A's reply, and a copy of the MP report that Anna Sanders filed on me (but couldn't recall anything about it in her voice message to me of November 10, 2007) next stop by the local cop shop, a.k.a. The West Valley Area Police Station, conveniently located right up the street in beautiful Reseda, CA. A pleasant group of folks serving the local community, 24/7. There is no Tarzana Police Department, so who was the Troll that Valerie was talking with, and where were they located? Only in her head, it appears. March 23, 2009. I received an unsigned copy of the "Findings of Fact and Conclusions of Law" and a "Final Judgment" paper, as drafted by Mr. Grant. As expected, it contains false statements including "(1) The court finds there has been a substantial change in circumstances due to a complete breakdown of communication between Ms. Rose and most other members of her extended family, including Claire and Mr. Swanson." Claire and I speak frequently on the telephone, and Eric has been replying to several of my more recent requests through email. This statement is followed by some additional and incorrect filler statements, and the line of "A further substantial change is that there has been no in-person contact between Claire and her mother for (a blacked out word) nearly a year." While that statement is correct in the aspect of my not having in person contact with my daughter for the last eleven months; it is not stated that the reason why I did not have Summer 2008 visitation is because Eric refused to arrange it with me, and neither he nor Mr. Grant had used legal channels prior to Eric withholding visitation to address their reasons for his doing so. Apparently, this court doesn't have any objection with one parent voluntarily breaking a standing child custody agreement, and producing whatever "proof" or "evidence" necessary to justify their actions, only when called out on it by the other party. You get the idea, Readers. I assume these draft papers were to be a recap of what the judge said, but they are not the exact words and statements that I recall hearing the judge speak. Apparently, the writer is allowed to put whatever spin and slant they choose, and the judge may then choose to sign them or not. I'll be posting the final papers when I receive them, with my full side by side review of the transcripts. Then we shall all be able to read what was said, and how they said it. I apparently didn't provide the court with adequate "proof" or "evidence" that folks were not telling the whole truth in their affidavits and verbal statements; nor does it appear that their inaccuracies, false statements, or conflicting accounts of events they submitted were considered to be anything less than fully reliable. In the written statements I sent to the court and the CCI, I pointed out many discrepancies, inaccurate, misleading, conflicting, and false statements, but they were apparently not considered to be important. Admittedly, my presentation during the hearing on March 13, 2009 was extremely weak, as it's rather difficult to prepare when no Witness List by the other party was submitted by the due dates, and one doesn't know what to expect the other side to say. I mistakenly had thought that court proceedings were about finding The Truth, and I must have been the only person participating who had that thought. I don't watch TV other than financial news and the weather, so my vision of how a courtroom process works was simultaneously overrated by my desire to speak and hear truthful statements, and under-informed by the reality of the spewing of storytelling. I received a Prehearing Memorandum from Mr. Grant on March 12, 2009 which I'll post later today, with my comments. NOTE: As with some other documents, I have smudged out some parts of this check, and my signature. 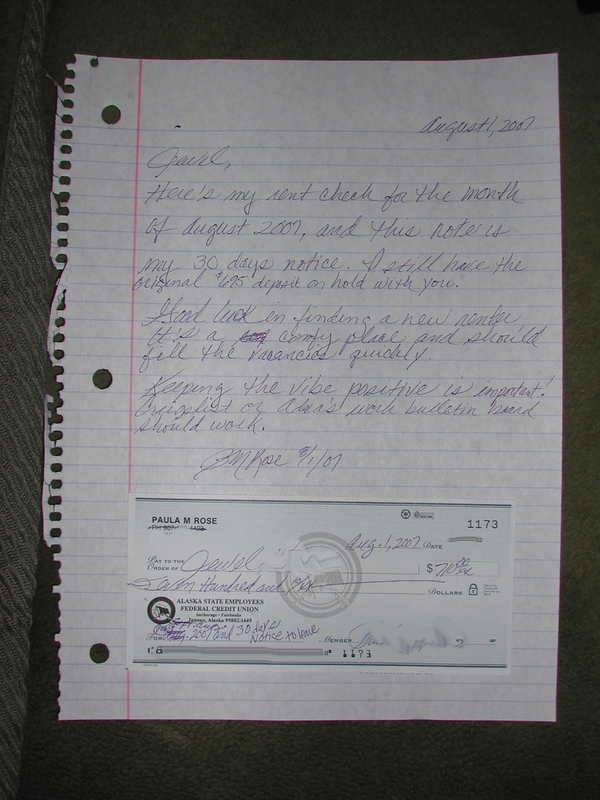 See my posting of the check below on the page created in approximately late April of 2008. During the March 13, 2009 hearing, Eric William Swanson gave testimony stating (I don't have the actual transcript to refer to) that he had a telephone conversation with someone named Jewel at some time, but he couldn't recall when. During his testimony, Eric stated that Jewel made some statements about me, including that I was late in paying my rent due her, and that she wanted me to move out of her home. I knew during the hearing that the information he was relaying was inaccurate and false, but didn't have this paper handy nor had I submitted it as evidence. FACT: My rent was due each month on the first (1st) day. FACT: This check is written in my handwriting and is dated August 1, 2007. FACT: The 30 day notice that I gave to Jewel is handwritten by me, and dated August 1, 2007. FACT: During the entire time frame that I rented a room from Jewel in her home, I was never late in paying my rent. FACT: Jewel never mentioned any such conversation with Eric to me, and if she did have one with him, it must have been prior to August 1, 2007. But my rent couldn't have been late, as it was not yet due. FACT: The wording and tone of my pleasant 30 day notice indicates no ill will or strain in our tenant / landlord relationship. FACT: The file date on this photo is August 1, 2007. I didn't have a copier, so I took a photo for my records.